AS-CLEAN can restore your scratched, faded or damaged paint work to a slick mirror like finish once again. Most of these are imperfections inflicted by Automatic / DIY car washes or poor wash techniques where sponges are used which can trap dirt and grit between the sponge and the paint work and scratch the surface resulting in swirl marks or even worse, deep scratches. Paint Correction involves a highly experienced operator measuring the paint work with a Digital Paint Thickness Gauge in several locations on each panel to determine how much paint is left on the vehicle, the paint work is hand washed using citrus pre-wash fallout clay barred to remove embedded contamination and imperfections are removed by machine polishing down to the depth of the defect to permanently remove them, this will remove such things as swirl marks, scratches, holograms, oxidation and buffer trails by using different combinations of compounds, abrasive polishes, finishing polishes and buffing pads to specifically suit your vehicle’s paint work. AS-CLEAN will not leave buffer trails like inexperienced operators or use products that contain fillers that will simply wash out within weeks, all products used are premium high quality polishes. Please note our Paint Correction service is only available at our Workshop. Paint Correction is suited to cars already in good condition with very minimal to no swirl marks that are just looking for a gloss enhancement. A Stage One is not enough to remove swirl marks from dark coloured cars. Paint Correction is suited to cars with minor to moderate swirl marks and light scratches, it involves an abrasive polish to remove imperfections followed by a finishing polish to refine the paint work further. 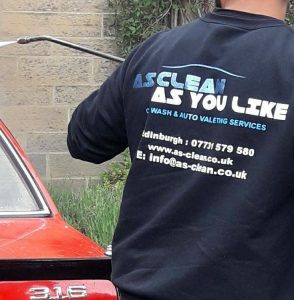 Paint Correction is suited to cars in poor condition with deeper scratches, heavy swirling or faded paint work, it involves a heavy cutting polish, followed by an abrasive polish then a finishing polish to refine the paint work further. Please call on 07731 579 580 for a quote or use our Online Booking Form.